•Account sufficiently for ad-hoc expenses. It could be the ad-hoc birthday treat that came up, an unexpected taxi ride or a course that you want to sign up for. •Do not stretch yourself too thin and do not spend more than what you have budgeted for. With new bank accounts (for example, OCBC 360 and UOB One) that give us higher interest by depositing our salary and making a minimum spending from the same place, we are given incentives to save and spend all from the same account. •Set up four bank accounts for the four areas you have budgeted for. •Direct your salary into one account and set an automated transfer to credit your salary each month to the other three accounts. 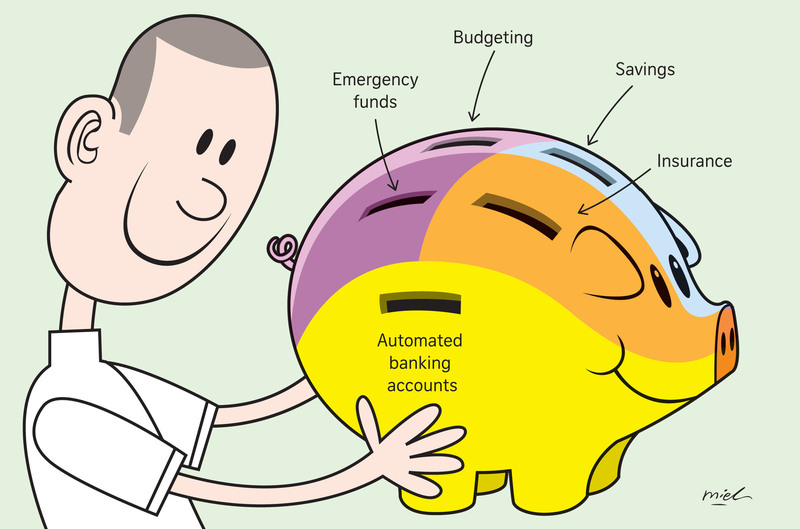 •Ensure that you do not have any ATM, debit or credit card access to your savings emergency fund bank accounts. It was so easy for me to touch these accounts when I had access to them. This account allows me to save up for big-ticket items that are coming up. Even if you are single now, it is important to save. You should be financially prepared when the love of your life appears. •A wedding in Singapore is more costly than what most people think. One couple in Singapore had a dream $110,000 wedding and ended up in severe debt. An entire wedding celebration with a banquet at a hotel can easily come up to at least $40,000. Remember that a wedding is a day, marriage is a lifetime. •The average amount spent on renovations is $56,000, according to home design firm Qanvast in 2014. Together with your wedding celebration, this is a large sum of cash to save up for. •If you are looking to purchase a car, you would need to set aside at least 40 per cent of the purchase price in cash. A new Toyota Corolla requires a down payment of at least $40,000. Many people underestimate the value of having emergency funds set aside. We need extra funds to tap to provide for an unexpected medical expense for a loved one and to tide us over in the event of a retrenchment. •A good guide is to save up six months of your monthly salary so that there is enough to tap in an unexpected event. •Consider setting a portion of your emergency funds in the risk-free Singapore Savings Bonds offered by the Singapore Government. Aim to grow your emergency fund as your salary increases. •Use term insurance to adequately insure yourself. Most of us do not need insurance for our entire lives, as our dependants would no longer be financially dependent on us at a later point in our lives. •Always compare products from the different insurers. This is because the price differences between the companies are much greater than what you might expect. •Ask your insurance adviser how he is being remunerated. Does your adviser earn more by selling you one product over another? While the world of investing and possibility of high returns seem exciting, it is critical that you do not dive into them until you have planned for the above five financial areas. Investing is for the long term and we should invest only if we have spare funds that we do not need for 10 years to ride the market volatility. By implementing the above money hacks and if you are debt-free, you would have started off on a sound financial footing. The journey to financial independence is a marathon and not a 100m dash. Plan well and you have won half the battle. •The writer is a brand management executive at DIYInsurance, a life insurance comparison Web portal by wealth management firm Providend.